STEP 1 - Holding one working end in each hand, place the working end in the right hand over the one in the left hand. STEP 2 - Pull it under and back over the top of the rope in the left hand. STEP 3 - Place the working end in the left hand over the one in the right hand and repeat STEP 2. STEP 4 - Dress the knot down and secure it with an overhand knot on each side of the square knot. Checkpoints. There are two interlocking bights. The standing parts are on the same side and properly secured with overhand knots. Double Sheet Bend. This knot is used to tie the ends of two or more ropes of equal or unequal diameter (Figure 2-8). When a single rope is tied to multiple ropes, the bight is formed with the multiple ropes. STEP 1 - Form a 30-centimeter bight in the left hand with the rope or ropes. Ensure that the short end of the bight is facing to the inside. STEP 2 - Place the index finger of the left hand on top of the bight. Bring the rope in the right hand up through the bight and over the index finger of the left hand, so the working end is away from the body. STEP 3 - Reach through the loop and grasp the working end of the rope and bring it back towards the body. Place it between the index finger and the bight, forming a round turn. Repeat this one more time, wrapping toward the tip of the index finger. STEP 4 - Remove the finger and dress the knot down. • The two wraps around the bight are held in place by a locking bar. • The two standing parts of the ropes exit parallel and from opposite ends of the knot. The two working ends form an "L" and exit the knot at a 90-degree angle and on opposite sides of the knot. Fisherman's Knot. This knot is used to tie two ropes of similar or dissimilar materials (Figure 2-9). The process of tying the knot involves a three-step procedure: STEP 1 - Tie an overhand knot in one end of the rope. STEP 2 - Pass the working end of the other rope through the first overhand knot. 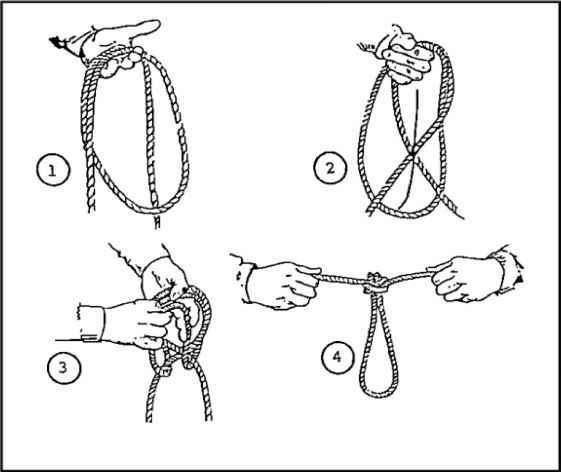 Tie an overhand knot around the standing part of the first rope with the working end of the second rope. STEP 3 - Tightly dress down each overhand knot and tightly draw the knots together. • The two separate overhand knots are tied tightly around the long standing part of the opposing rope. • The two overhand knots are drawn snug. Double Fisherman's Knot. This knot is also called double English or grapevine, and it is used to tie two ropes of similar or dissimilar materials (Figure 2-10). STEP 1 - With the working end of one rope, tie two wraps around the standing part of another rope. STEP 2 - Insert the working end (STEP 1) back through the two wraps and draw it tight. 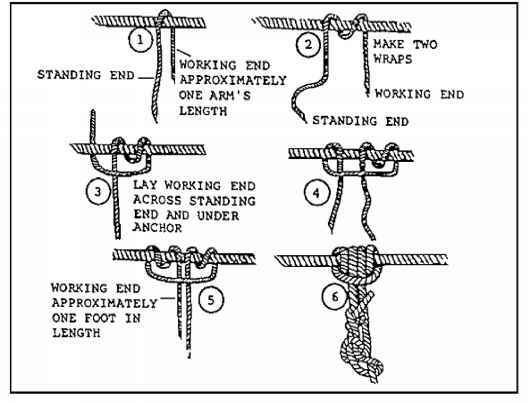 STEP 3 - With the working end of the other rope, which contains the standing part (STEPS 1 and 2), tie two wraps around the standing part of the other rope (the working end in STEP 1). Insert the working end back through the two wraps and draw tight. STEP 4 - Pull on the opposing ends to bring the two knots together. • Two wraps with the working end running through and drawn tight. • Both wraps are drawn together with all the slack out of the knot. Water Knot. This knot is also called a ring bend, overhand retrace, or tape knot. It is used to attach two webbing ends, and it is also used in runners and harnesses (Figure 2-11). The process of tying the knot involves a three-step procedure: STEP 1 - Tie an overhand knot in one of the ends. STEP 2 - Feed the other end back through the knot, following the path of the first rope in reverse. STEP 3 - Draw tight and pull all of the slack out of the knot. The remaining tails must extend at least 5 centimeters (2 inches) beyond the knot in both directions. • There are two overhand knots, one retracing the other. • There is no slack in the knot, with the working ends coming out of the knot in opposite directions (at least 5 centimeters [2 inches] long). Bowline Knot. This knot is used to tie a single fixed loop in the end of a rope. It is always used when there is alternating tension, and may also be used to tie the end of a rope to an anchor (Figure 2-12). It does not slip under strain and is easily untied. STEP 1 - Bring the working end of the rope around the anchor, from right to left (as the climber faces the anchor). STEP 2 - Form an overhand loop in the standing part of the rope (on a climber's right) toward the anchor. STEP 3 - Reach through the loop and pull up a bight. STEP 4 - Place the working end of the rope (on the climber's left) through the bight, and bring it back onto itself. Now dress the knot down. STEP 5 - Form an overhand knot with the tail from the bight. • The loop is locked into place by a bight. • The short portion of the bight is on the inside and on the loop around the anchor (or inside the fixed loop). Round Turn and Two Half Hitches Knot. 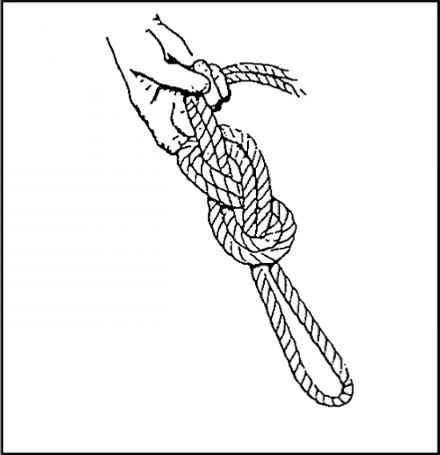 This knot is used to tie the end of a rope to an anchor, and it must have constant tension (Figure 2-13). STEP 1 - Route the rope around the anchor from right to left and wrap down (must have two wraps in the rear of the anchor, and one in the front). Run the loop around the object to provide 360-degree contact, distributing the load over the anchor. STEP 2 - Bring the working end of the rope left to right and over the standing part, forming a half hitch (first half hitch). STEP 3 - Repeat Step 2 (last half hitch has a 15-centimeter [6 inch] pigtail). STEP 4 - Dress the knot down. • A complete round turn should exist around the anchor with no crosses. • Two half hitches should be held in place by a locking bar with no less than a 15-centimeter tail remaining. • Look at the top of the half hitches; the rope should appear to be one continuous rope. Figure Eight Retrace Knot. 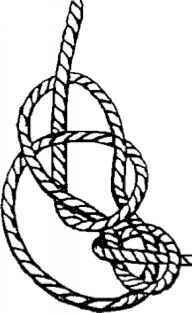 This knot is also called rerouted figure eight. This knot produces the same result as a figure eight loop discussed in "Class III - middle rope knots." By tying the knot in a retrace, it can be used to fasten the rope to trees or to places where the loop cannot be used (Figure 2-14). STEP 1 - Use a length of rope long enough to go around the anchor, leaving enough rope to work with. STEP 2 - Tie a figure eight knot in the standing part of the rope, leaving enough rope to go around the anchor. To tie a figure eight knotForm a loop in the rope. Wrap the working end around the standing part. Route the working end through the loop. The finished knot is dressed loosely. STEP 3 - Take the working end around the anchor point. STEP 4 - With the working end, insert the rope back through the loop of the knot in reverse. STEP 5 - Keep the original figure eight as the outside rope and retrace the knot around the wrap and back to the long standing part. STEP 6 - Safety off with an overhand knot. • At least 15 centimeters (6 inches) of rope extends past the figure eight knot. • The original figure eight, tied with the standing end, remains as the outermost rope throughout the knot. • The knot is dressed tightly. STEP 1 - Hold rope in both hands, palms down with hands together. Slide the left hand to the left from 20 to 25 centimeters (8 to 10 inches). STEP 2 - Form a loop away from and back toward the right. STEP 3 - Slide the right hand from 20 to 25 centimeters (8 to 10 inches) to the right. Form a loop inward and back to the left hand. STEP 4 - Place the left loop on top of the right loop. Place both loops over the anchor and pull both ends of the rope in opposite directions. The knot is tied. STEP 1 - Place 76 centimeters (30 inches) of rope over the top of the anchor. Hold the standing end in the left hand. With the right hand, reach under the horizontal anchor, grasp the working end, and bring it inward. STEP 2 - Place the working end of the rope over the standing end (to form a loop). Hold the loop in the left hand. Place the working end over the anchor from 20 to 25 centimeters (8 to 10 inches) to the left of the loop. STEP 3 - With the right hand, reach down to the left hand side of the loop under the anchor. Grasp the working end of the rope. Bring the working end up and outward. STEP 4 - Dress down the knot. • The knot has two round turns around the anchor with a locking bar. • The locking bar is facing 90 degrees from the direction of pull. • The ends exit 180 degrees from each other. • The knot has more than a 15-centimeter (6-inch) pigtail remaining. • You should not use a clove hitch knot on metal, except on a picket-hold-fast. Wireman's Knot: This knot forms a single, fixed loop in the middle of the rope (Figure 216). STEP 1 - When tying this knot, face the anchor that the tie-off system will be tied to. Take up the slack from the anchor, and wrap two turns around the left hand (palm up) from left to right. STEP 2 - A loop of 30 centimeters (12 inches) is taken up in the second round turn to create the fixed loop of the knot. STEP 3 - Name the wraps from the palm to the fingertips: heel, palm, and fingertip. STEP 4 - Secure the palm wrap with the right thumb and forefinger, and place it over the heel wrap. STEP 5 - Secure the heel wrap and place it over the fingertip wrap. STEP 6 - Secure the fingertip wrap and place it over the palm wrap. STEP 7 - Secure the palm wrap and pull up to form a fixed loop. STEP 8 - Dress the knot down by pulling on the fixed loop and the two working ends. STEP 9 - Pull the working ends apart to finish the knot. 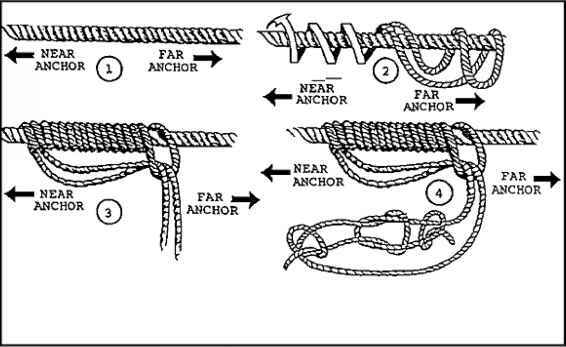 • The completed knot should have four separate bights locking down on themselves with the fixed loop exiting from the top of the knot and laying toward the near side anchor point. • Both ends should exit opposite each other without any bends. Directional Figure Eight Knot. This knot forms a single, fixed loop in the middle of the rope that lays back along the standing part of the rope (Figure 2-17). STEP 1 - Face the far side anchor so that when the knot is tied, it lays inward. STEP 2 - Lay the rope from the far side anchor over the left palm. Make one wrap around the palm. STEP 3 - With the wrap thus formed, tie a figure eight knot around the standing part that leads to the far side anchor. STEP 4 - When dressing the knot down, the tail and bight must be together. • The loop should be large enough to accept a snaplink but no larger than a helmet. • The tail and bight must be together. • The figure eight is tied tightly. • The bight in the knot faces back toward the near side. Bowline on a Bight Knot. This knot is used to form two fixed loops in the middle of a rope (Figure 2-18). STEP 1 - Form a bight in the rope about twice as long as the finished loops will be. STEP 2 - Tie an overhand knot on the bight. STEP 3 - Hold the overhand knot in the left hand so that the bight is running down and outward. STEP 4 - Grasp the bight with the right hand, fold it back over the overhand knot so that the overhand knot goes through the bight. STEP 5 - From the end (apex) of the bight, follow the bight back to where it forms the cross in the overhand knot. Grasp the two ropes that run down and outward and pull up, forming two loops. STEP 6 - Pull the two ropes out of the overhand knot and dress the knot down. STEP 7 - A final dress is required: grasp the ends of the two fixed loops and pull, spreading them apart to ensure the loops do not slip. • There are two fixed loops that will not slip. Figure Eight on a Bight Knot. This knot is used to form two fixed loops in the middle of a rope (Figure 2-19). STEP 1 - Using a doubled rope, form a 46-centimeter (18-inch) bight in the left hand with the running end facing to the left. STEP 2 - Grasp the bight with the right hand and make a 360-degree turn around the standing end in a counterclockwise direction. STEP 3 - With the working end, form another bight and place that bight through the loop just formed in the left hand. STEP 4 - Hold the bight with the left hand, and place the original bight (moving toward the left hand) over the knot. STEP 5 - Dress the knot down. There is a double figure of eight with two loops. The knot will not slip. Overhand Loop. This loop forms a single loop in the middle of a rope (Figure 2-20). It should not be used in a transport tightening system. STEP 1 - Form a bight in the rope about as long as the loop needed. STEP 2 - With the bight, form an overhand knot using the bight as the working end. Dress the knot tightly. • The ropes in the overhand knot are parallel and do not cross over each other. • The knot is tightly dressed. Figure Eight Loop. This loop is a variation of the overhand loop and is easy to untie after it has held weight (Figure 2-21). STEP 1 - Form a bight in the rope about as large as the diameter of the desired loop. STEP 2 - With the bight as the working end, form a loop in rope (standing part). STEP 3 - Wrap the working end around the standing part 360 degrees and feed the working end through the loop. Dress the knot tightly. • The ropes in the loop are parallel and do not cross over each other. Single Butterfly Knot. This knot is used to form a single fixed loop in the middle of the rope without using the ends (Figure 2-22). 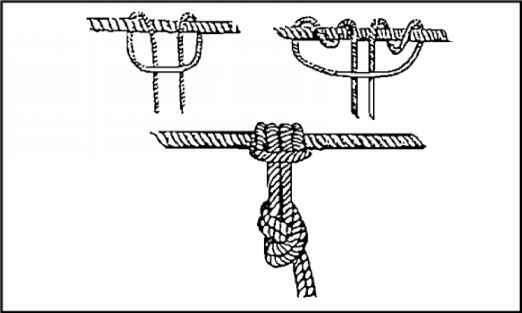 You may use this knot for the middle man in a rope party as well as in a transport tightening system. The knot can be hard to untie when heavy weight has been placed on it for extended periods. The process of tying the knot involves a four-step procedure: STEP 1 - Form a loop over the palm of the left hand. STEP 2 - With the right hand, cross the two long-standing ends; reach under and grasp the bottom of the loop formed in STEP 1. STEP 3 - Route the bottom of the loop over the crossed standing ends and back through the top of the loop. STEP 4 - Hold the newly formed loop and dress the knot down, removing all of the slack out of the knot. • The wings of the knot must be dressed down tightly and as close together as possible. • The ropes between the wings must be parallel with no crossovers. • The loop should be no larger than a helmet, but large enough to accept a snaplink. • All ropes in the knot are tightly dressed. Prusik Knot. This knot is used to put a moveable rope on a fixed rope such as a Prusik ascent or a tightening system. This knot can be tied as a middle, finger, or end Prusik. 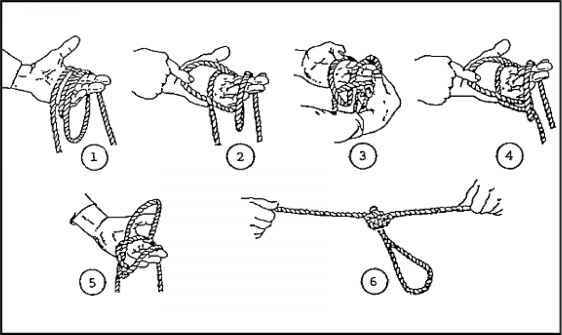 • The process of tying the middle-of-the-rope Prusik knot involves a three-step procedure (Figure 2-23). STEP 1 - Double the short rope, forming a bight, with the working ends even. Lay it over the long rope so that the closed end of the bight is 30 centimeters (12 inches) below the long rope and the remaining part of the rope (working ends) is the closes tot he climber; spread the working end apart. STEP 2 - Reach down through the 30-centimeter (12-inch) bight. Pull up both of the working ends and lay them over the long rope. Repeat this process making sure that the working ends pass in the middle of the first two wraps. Now there are four wraps and a locking bar working across them on the long rope. STEP 3 - Dress the wraps and locking bar down to ensure they are tight and not twisted. 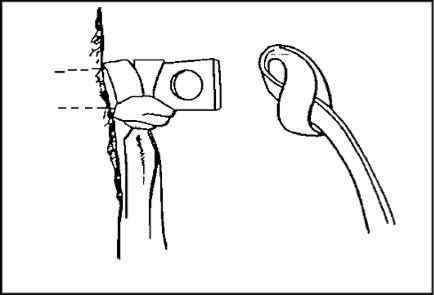 Tying an overhand knot with both ropes will prevent the knot from slipping during periods of variable tension. 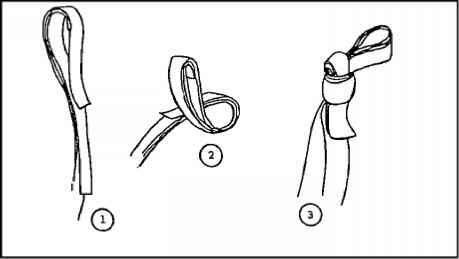 • Another way of tying the Prusik knot is the finger Prusik as shown in Figure 2-24, and involves a five-step procedure. STEP 1 - Lay the rope across the thumb and index finger of the left hand. STEP 2 - Wrap the rope around the index finger twice (wrapping away from the climber). Wrap the rope around the thumb twice (wrapping toward the climber). STEP 3 - Place the thumb and index finger tip to tip. Push the wraps together so that the Prusik is on the left thumb. There are four wraps and a locking bar across them. STEP 4 - Take the running end of the rope and pass it through the wraps of the Prusik knot. STEP 5 - Dress the wraps and locking bar down to ensure they are tight and not twisted. • The third way of tying a Prusik knot is the end-of-the-rope knot as shown in Figure 2-25, and involves a seven-step procedure. FIGURE 2-25. End-of-Ehe-Rope Prusik Knot. STEP 1 - Using an arm's length of rope, place it over the long rope. STEP 2 - Form a complete round turn in the rope. STEP 3 - Cross over the standing part of the short rope with the working end of the short rope. STEP 4 - Lay the working end under the long rope. STEP 5 - Form a complete round turn in the rope, working back toward the middle of the knot. STEP 6 - There are four wraps and a locking bar running across them on the long rope. Dress the wraps and locking bar down. Ensure they are tight, parallel, and not twisted. STEP 7 - Finish the knot with a bowline to ensure that the Prusik knot will not slip out during periods of varying tension. • Four wraps with a locking bar. • The locking bar faces the climber. • The knot is tight and dressed down with no ropes twisted or crossed. 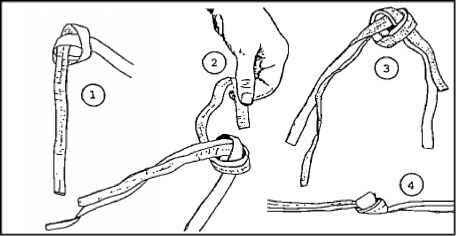 • Other than a finger Prusik, the knot should contain an overhand or bowline to prevent slipping. Bachman Knot. This knot provides a means of using a make-shift mechanized ascender (Figure 2-26). The process of tying the knot involves a three-step procedure: STEP 1 - Find the middle of a utility rope and insert it into a snaplink. STEP 2 - Place the snaplink and utility rope next to a long climbing rope. STEP 3 - With the two ropes parallel from the snaplink, make two or more wraps around the climbing rope and through the inside portion of the snaplink. • The bight of the climbing rope is at the top of the snaplink. • The two ropes run parallel without twisting or crossing. • Two or more wraps are made around the long climbing rope and through the inside portion of the snaplink. Bowline on a Coil. 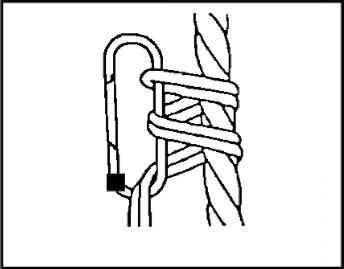 This knot is an expedient tie-in used by climbers in two- and three-man party climbs when a climbing harness is not available (Figure 2-27). FIGURE 27. Bowline on a coil. STEP 1 - To tie a bowline on a coil, start the same as tying a bowline around the waist (the waist of the climber is the anchor point). The climber has about 40 centimeters (16 inches) of rope in the right hand. The standing end is coming from the remainder of the rope in his left hand. STEP 2 - Draw slack from the standing end of the rope in the left hand, wrapping enough coils around the body to complete a minimum of four (but no more than six) coils. STEP 3 - With the rope in the left hand, make a loop inward with the standing end. STEP 4 - Slide the loop up between the horizontal wraps and the body, ensuring the loop does not come uncrossed. STEP 5 - Bring a bight up through the loop. Bring the working end of the rope in the right hand through the bight and back onto itself. Insert the short working end to the right through the loop (just passed through the wraps). Pass the working end around the long standing end and back on itself, forming a bight. STEP 6 - Dress the knot down. STEP 7 - Safety with an overhand knot against the knot formed on the top single coil. There should be from 10 to 15 centimeters of rope left (standing part). • There are a minimum of four (maximum of six) parallel wraps; the top and bottom ropes cross forward of the hips. • The loop must be underneath all wraps. • Other checkpoints are the same as the bowline. Three-Loop Bowline. 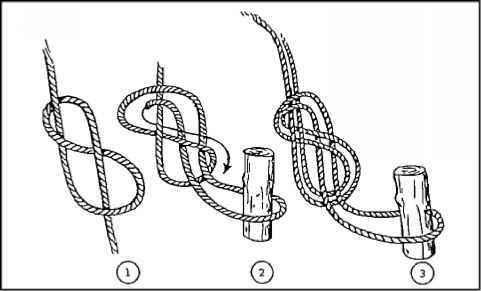 This knot is used to form three fixed loops in the middle of a rope. It is also used in a self-equalizing anchor system (Figure 2-28). STEP 1 - Form about a 60-centimeter (24-inch) bight in the rope, laying it across the left hand, palm up, with the bight to the front. STEP 2 - With the right hand, form a loop with both ropes. Hold it in the left hand. STEP 3 - With the right hand, bring the long bight through the loop (formed in STEP 2) and around the two standing ends. STEP 4 - Follow the bight around the standing ends and back down into the loop. STEP 5 - Hold all three loops in the left hand. 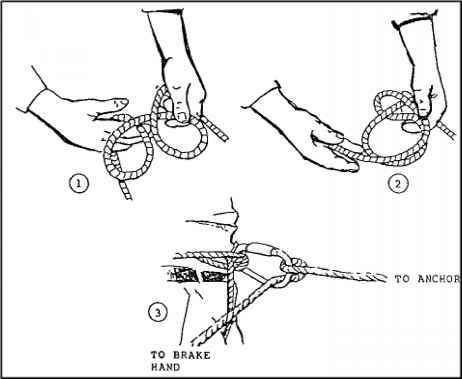 With the right hand, grasp both standing ropes and pull while dressing up the bowline. 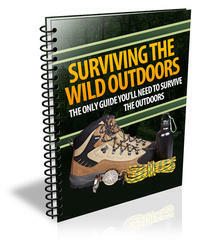 • Checkpoints are the same as for a regular bowline, except that it is tied with two ropes. 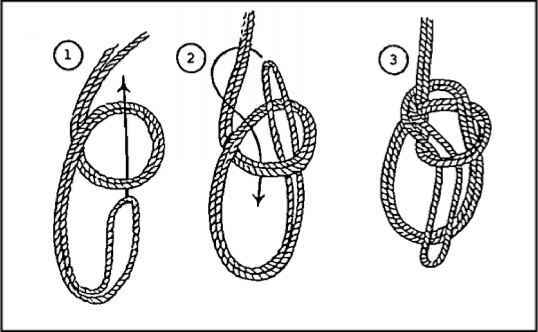 • An overhand knot must be tied if the third loop is not to be used as a secondary anchor. 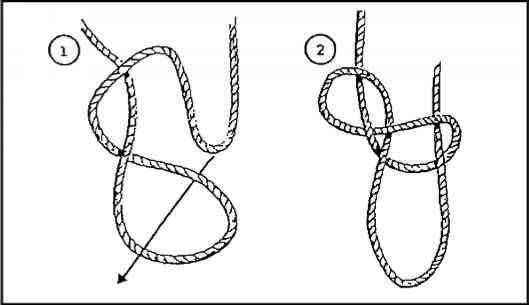 Figure Eight Slip Knot. This knot forms an adjustable bight in a rope (Figure 2-29). STEP 1 - Form a 30-centimeter (12-inch) bight in the end of the rope. STEP 2 - Hold the center of the bight in the right hand. Hold the two parallel ropes from the bight in the left hand about 30 centimeters (12 inches) up the rope. STEP 3 - With the center of the bight in the right hand, twist two complete turns clockwise. STEP 4 - Reach through the bight and grasp the long standing end of the rope. Pull another bight (from the long standing end) back through the original bight. STEP 5 - Pull down on the short working end of the rope and dress the knot down. 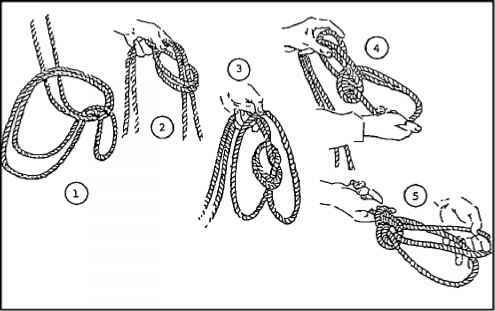 STEP 6 - If the knot is to be used in a transport tightening system, take the working end of the rope and form a half hitch around the loop of the figure eight knot. • The knot is in the shape of a figure eight. • The sliding portion of the rope is the long working end of the rope. Kleimhiest Knot. This knot provides a moveable, easily adjustable, high-tension knot capable of holding extremely heavy loads while being pulled tight (Figure 2-30). When used in a transport tightening system, a six-man pulling team is necessary. STEP 1 - Using a military rope, offset the ends by 30 centimeters (12 inches). With the ends offset, find the center of the rope and form a bight. Lay the bight over a horizontal rope near the farside anchor. STEP 2 - Wrap the tails of the utility rope around the horizontal rope back toward the near-side anchor. Wrap at least four complete turns. STEP 3 - With the remaining tails of the utility rope, pass them through the bight (see STEP 1). STEP 4 - Join the two ends of the tail with a joining knot (square knot with overhand safety knots). STEP 5 - Dress the knot down tightly so that all wraps are touching. Insert two snaplinks (opposing gates) into the large loop tied with the tails. • The bight is closest to the far-side anchor. • All wraps are tight and touching. • The ends of the utility rope are properly secured with the joining knot. Overhand Knot. 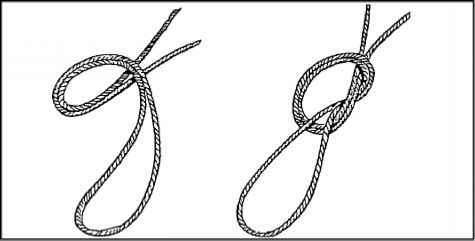 This knot is used to make a knotted rope for a handline, to secure the ends of other knots, and to make stirrups in direct-aid climbing (Figure 2-31). It can also be used to temporarily whip the end of a rope. The process of tying the knot involves a three-step procedure: STEP 1 - Make a loop in the rope. STEP 2 - Pass the working end of the rope through the loop. STEP 3 - Tighten down the knot. • Running ends exit the loop in opposite directions. • The knot is dressed down tightly. Frost Knot. This knot is used when working with flat webbing, and it holds better than a standard overhand knot or square knot (Figure 2-32). STEP 1 - Lap one end (a bight) of webbing over the other (about 25 to 30 centimeters [10 to 12 inches]). STEP 2 - Tie an overhand knot with the newly formed triple-strand webbing; dress tightly. • The tails of the webbing run in opposite directions. • Three strands of webbing are formed into a tight overhand knot. • There is a bight and tail exiting the top of the overhand knot. Girth Hitch. This is used when tying a runner to a partly driven piton (Figure 2-33). FIGURE 2-33. Girth Hitch Knot. STEP 1 - Bring the standing ends back through the bight of a length of rope or webbing. STEP 2 - Cinch the knot tightly. • Two wraps exist with a locking bar running across the wraps. 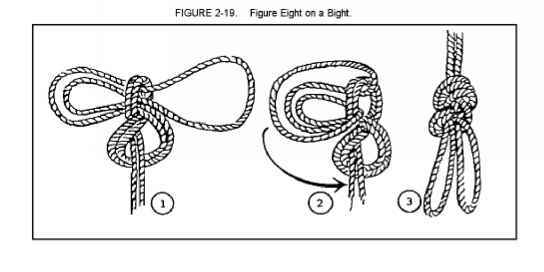 How to tie rerouted figure 8 knot?